MMS requires a technologically advanced system of four identically equipped with spacecraft, which will fly in a tight, tetrahedral formation in Earth's magnetic environment  the magnetosphere  considered the best laboratory for studying magnetic reconnection. But the technological advances needed for MMS start long before the spacecraft are put together. Such advances are also found inside the brand new, 4,200-square-foot, environmentally friendly facility where engineers and scientists at NASA's Goddard Space Flight Center in Greenbelt, Md., will assemble and integrate the four spacecraft. The new high-tech facility resides in former warehouse space that a team of contractors and Goddard employees transformed into a "smart cleanroom." The air inside the space is relatively free of dust, aerosol particles, and chemical vapors  contaminants that can damage highly sensitive science instruments and hardware. To give perspective, outdoor air in a typical urban area contains one million particles per cubic foot. 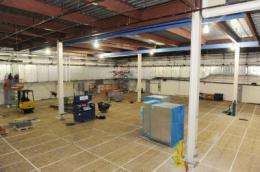 But the MMS cleanroom will have no more than 10,000 particles per cubic foot. These particles are small, too, measuring less than half a micron in diameter or about half the width of a human hair. The size of the MMS cleanroom is notable, second only to Goddard's other cleanroom  one of the world's largest -- where technicians are assembling the James Webb Space Telescope. "It's versatile," says company president Kathie Kalafatis. Unlike fans in traditional cleanrooms that run at full throttle at all times  regardless of the cleanliness of the air  this cleanroom senses particulates in the air stream and can modulate the fan speed up and down depending on the particle readings to make sure the room always stays in specification. This level of control allows technicians to partition off parts of the room to accommodate different missions. "I call it the room-in-a-room concept," she says.